Stay at one of Ireland’s last great castles still inhabited by its famous and eccentric founding family, Castle Leslie, and enjoy a dream equestrian vacation. This is a once in a lifetime riding vacation at a truly special place. What makes Castle Leslie special is that your hosts are the family that sill owns and maintains the estate. You are a guest of the Leslie family, welcomed into their home and subject to their gracious hospitality. Companions or group members who do not wish to ride may enjoy fishing for pike in the lake, walking trails, the Victorian themed spa, carriage rides and fine food. You may also just relax inside the opulent, yet homey castle, where beautiful furniture, antiques and family heirlooms abound. Castle Leslie Estate is one of the last great Irish estates that is still in the hands of its founding family. The Leslie Family arrived to Ireland in the 16th Century and bought the Estate at that time. The Leslie Family has a long history, tracing their ancestry back to Attila the Hun. Today, Castle Leslie is run and managed by Sammy Leslie and governed by a Family Trust. The family wishes to protect the estate's land for future generations. If you are lucky, you’ll meet Sir John Norman Ide "Jack" Leslie, 4th Baronet, who’s led an extremely interesting life and still lives in the castle. He's the first cousin once removed of former British Prime Minister Winston Churchill and has entertaining stories and great piano playing skills. When Equitrekking recently visited Castle Leslie, Jack entertained us and the other guests by playing piano in the grand Drawing Room. In June 2002, Castle Leslie Estate made headlines when it hosted the wedding of Paul McCartney and Heather Mills. Many celebrities and famous guests have frequented Castle Leslie including Irish poet WB Yeats, Rolling Stones singer Mick Jagger, Prince Pierre of Monaco and members of the Churchill family, to whom the Leslie family is related. Consider packing some nicer clothing for dinners in the castle and on the estate. Castle Leslie can assist you in getting your laundry done at an additional cost. Castle Leslie has 30 fit Irish horses and 9 ponies for your horse riding holidays in Ireland. Breeds include Connemara Ponies and Irish Sport horses housed in the Castle's 56 stables. Horses are well schooled and capable of jumping, dressage or trail rides for beginners and advanced riders. Grip Fast – the Leslie family motto originates from a famous horse journey by Bartholomew Leslie in the 11th century. His passion for horses was passed down through the ages and now on Castle Leslie Estate the Horse is King and you too can discover the thrill of riding across one of Ireland's great estates. Riders looking to improve their form and beginners looking to get the feel of a horse before heading out on the estate grounds will delight in riding Prince, Castle Leslie's virtual horse. Try some of the best pike fishing in Europe on Castle Leslie's peaceful lake. The Leslie family has carefully managed the beautiful Glaslough or Green Lake for generations. Many consider the lake to be one of the best-preserved lakes in Ireland. It's also known for its monster pike. In 1991, a specimen weighing 38lb 9oz (17.5kg) was caught in the lake and broke the 18-year official Irish record. Castle Leslie’s spa is inspired by organic and Victorian themes. Victorian Treatment Rooms are complete with Victorian steam boxes and an outdoor hot tub. Detoxify with sweet smelling organic products, soothing massages and body and face treatments. Indulge in a mud wrap, chocolate truffle wrap, facial or hot stone therapy. Watch a movie in the private cinema in the castle or enjoy a true game of Billiards. Walk, hike or stroll trails that wind through woodland and by pristine lakes or head into the adjacent village of Glaslough. On the estate grounds, equestrians get the upper hand, but the Ulster Canal Cycle Trail passes through Glaslough village and guests are welcome rent a bike to follow the route and take in the scenery in the surrounding area. There are four 18 hole Golf courses within an hour of the Castle. Staying in the Castle is a once in a lifetime experience. Each of the 20 bedrooms with private bathrooms is individually decorated with priceless family antiques and heirlooms and comfortable bedding. The Castle bedrooms are technology free, allowing you to truly get away from the hassles of the modern world. You won’t find TV’s, radios, wifi or mini-bars in the Castle bedrooms. Each room is different in the castle with its own history and story, told through the current decor. Many are painted with dramatic, rich colors, like the Blue and Red Rooms. Sleep where royalty have dreamt in the Mauve Room, called The Royal Suite, where Queen Margaret of Sweden, The Duke and Duchess of Connaught, Prince Pierre of Monaco (the father of Prince Rainier III) and Prince Kessee spent nights. Mick Jagger and Marianne Faithful also slept in the Mauve Room. The equestrian themed hunting Lodge at Castle Leslie Estate has 30 individually decorated rooms with period pieces. The lodge is a very social area on the estate and a great choice for equestrians, as it overlooks the stone stable courtyard. Adjacent to the Equestrian Center, the lodge also houses the Victorian spa. Wireless Internet access is available in all public areas in the Lodge. There are many common areas and small rooms to retreat to with a book or a glass of wine or tea. Superior bedrooms are large and offer the added feature of a balcony overlooking the Equestrian Centre's courtyards. Classic bedrooms in the original building and stables are decorated in a traditional style while rooms in the newer wings are more contemporary in style. The spacious bathrooms include roll top baths and separate power showers. Many rooms feature super king beds for a dreamy night’s sleep. Castle Leslie has a variety of dining options on the estate ranging from casual classic Irish fare to fine dining in an elegant, romantic setting. No matter where you eat on the estate, you will enjoy the best of classic Irish cooking. Castle Leslie sources regional and artisan foods locally and prepares and presents them with imagination and flair. Their daily-baked breads and scones and homemade preserves are enough to tempt any guest. At Castle Leslie Estate, it’s all about choice. Guests can look forward to lazy breakfasts, light lunches or picnic lunches in the woodlands, Irish country cooking in the bar or brasserie and candlelit dinners and formal afternoon tea in the Castle. Andrew Bradley, the Executive Chef at Castle Leslie Estate, cooks up centuries old Leslie family recipes and new cuisine based on his Michelin experience for dinner in Castle Leslie’s candlelit dining room. Taste fine wines as you enjoy a regal dining experience. The desserts are scrumptious! Breakfast at the castle ranges from continental cereals, Irish cheese, croissants and yogurt to full Irish fare with sausages, potato bread and bacon to buttermilk pancakes and omlettes. Enjoy piping hot Irish tea in the afternoon with fresh scones with jam and clotted cream, snack sized sandwiches and perhaps a class of champagne in the elegant drawing room. Looking for something more relaxed? Head over to Conor’s Bar and Lounge for traditional Irish food including sandwiches and burgers, salads and drinks. Conor's Bar sometimes hosts live music and many times has a roaring fire going to keep you warm on cooler Irish nights. With views out over the area woodland, Snaffles provides an upscale, relaxed dining experience. Offering a fresh approach to modern Irish cuisine, Snaffles’ chef prepare dishes in a state of the art wood stone burning oven. Self catering guests may ask Castle Leslie staff to stock their kitchen or get homemade meals delivered or head into the village for a meal. You may also request picnic baskets from Castle Leslie staff and enjoy a meal al fresco! Equestrians and their non-riding friends will delight in this special castle equestrian vacation. Equitrekking Travel’s Castle Leslie Ireland horse vacation is great for beginning riders, who can take lessons on Prince, a virtual horse, before venturing out to enjoy gentle trail rides on the expansive grounds. Advanced riders may want to work on their equestrian training with cross country, dressage training or show jumping skills at the world-class Castle Leslie equestrian centre. Includes 3 hours riding per day, 5 nights Bed & Full Breakfast and a choice of a 2-course meal each night in Conor’s Bar or a main course in Snaffles Restaurant. Activity will be part of a group session. Includes 5 nights Bed & Full Irish Breakfast and a choice of a 2- course meal in Conor’s bar each night or a main course in Snaffles Restaurant. * These prices can vary based on exchange rates. Self-catering accommodation is also popular and can be perfect for larger groups or if you prefer complete flexibility. If staying in self-catering accommodation all meals are payable locally and the riding programme is tailored according to your requirements. Please call or email for details. Your personal riding holiday will be designed to suit your riding experience, so contact us to get matched with the best itinerary. If you have chosen the Horse Sport Program, then it may be a combination of dressage, show jumping, cross-country and estate rides. If you prefer to trails and riding out over the Estate, the Happy Hacker Vacation is a good fit for you. 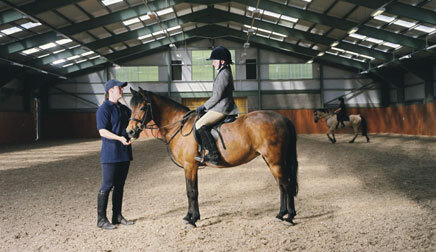 Beginner riders are welcome and the riding is tailored to your ability and wishes (Learn to Ride Programme). When you arrive at Castle Leslie your riding itinerary will be outlined for you (based on the riding experience profile you have submitted). If you would like to make any alterations to the times of your rides or the discipline scheduled for you, then you should request this since it is normally possible to make changes (although flexibility may be limited at very busy times). For the more experienced rider looking to improve their riding skills. This Ireland riding vacation incorporates a mix of show jumping, cross country, dressage and estate rides. This is a 5 day riding holiday with 3 hours riding per day, 5 nights Bed & Full Breakfast and a choice of a 2 course meal each night in Conor’s Bar or a main course in Snaffles Restaurant. Activity will be part of a group session. Happy Hackers is for anyone who enjoys the simple pleasure exploring the countryside on horseback. This Ireland equestrian vacation involves daily estate rides. This is a 5 day riding vacation with 3 hours riding per day, 5 nights Bed & Full Breakfast and a choice of a 2 course meal each night in Conor’s Bar or a main course in Snaffles Restaurant. Activity will be part of a group session. For beginners or riders who wish to improve their riding skills while enjoying some gentle hacks around the Estate. Each rider will receive a series of lessons culminating in a 2 hour ride around the estate. This is a 5 day riding vacation. 3 hours riding per day, 5 nights Bed & Full Irish Breakfast and a choice of a 2 course meal in Conor’s Bar each night or a main course in Snaffles Restaurant. Activity will be part of a group session. * Itineraries are subject to changes due to the weather, the trip guide's discretion and other factors. Sue and I wanted to thank you and your staff at the equestrian facility for such a pleasant visit. Just wanted to say thanks for the great riding at Castle Leslie Equestrian Centre during the week. I particularly enjoyed the cross country, which I started on Maisie and finished on Scooter. Fantastic! The two hour hack on Blue was a lovely way to see around the estate. What a great bunch of horses you have in such lovely surroundings. First time for our group at the centre and I'm sure it won't be the last ! Staff were incredibly well organised, very efficient and very friendly. Choosing my favourite place to go riding in Ireland is next to impossible. But if I were to book tomorrow I’d choose Castle Leslie. You can bring your own horse (if you like) to ride through 400 hectares of private land, including woodland gallops, cross-country jumps, bridleways for gentle hacking and, to finish off, a plunge through a lake that had me laughing with the thrill. You don’t have to go far in pursuit of unashamed luxury. A grand old pile of, set in a 1000 acre County Monaghan Estate, Castle Leslie manages that rare thing – to be both utterly luxurious and pleasantly informal at the same time. There are all sorts of activities to keep you happy and occupied, such as pike fishing in the lake or riding. True to their motto, the Leslies have held tightly to family traditions, foremost among them entertaining guests. Swift was a regular visitor; he often stopped at Castle Leslie on his way to his estate in nearby Armagh, where he penned Gulliver’s Travels. William Butler Yeats may not have written any poems about Castle Leslie, but he often slept in the estate’s Red Room. The Duke of Wellington, a cousin of the Leslies, spent time here before and after defeating Napoléon at Waterloo, and the Pre-Raphaelite painters John Ruskin and Dante Gabriel Rossetti were frequent houseguests of the first baronet in the late 19th century... Castle Leslie is indeed a sanctuary for those who are able to return. The 35-bedroom hunting lodge houses a Victorian spa with steam boxes and organic treatments, and at the $14.8 million equestrian center a mechanical horse helps break in any novices. But the castle itself — and its colorful past — is still the main attraction. Request a tour with great-uncle Jack Leslie to hear tales of its illustrious guests, and see if Sammy is around for a chat. After all, it's her passion that brought the rambling Castle Leslie and its vast, landscaped grounds back to life. March through October is ideal. Castle Leslie has special events and activities throughout the year so contact us for special occasions.